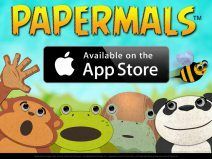 Papermals Pre-K is a brand new app designed for children ages 4-6 who are getting ready for kindergarten. For use on all iOS devices – iPad, iPhone, iPod Touch – kids will be able to interact with each activity as they practice math skills. Covering everything from shapes, and coins to counting, children are sure to master the skills they need before entering the classroom. If you are looking for an app to support early elementary school students who are struggling with foundational skills, or simply recommend an app to Pre-K parens, Papermals is worth checking out. With a kid-friendly interface and bright graphics, children will love this educational app. Papermals Pre-K is available in both English and Spanish. To learn more visit their website or the App Store!